When you are travelling out in the wilderness in your RV, you could go one day, or even more at a time without being connected to the rest of the world. While it may be considered a good thing, you still would want to know about any extreme changes in weather as you enjoy yourself, and that is why you should get a weather station for your RV. RV weather stations allow you to forecast weather from a control panel on the device itself, or from your smartphone, so that you know some detailed information about current or future weather around you. This information is obtained by acquiring data from satellites, so you will have access to the weather 34/7, rain or shine. In this review, we will be taking a look at 5 great weather stations for RV. The companies that make these stations include AcuRite and La Crosse. Which is the best weather station? Read on to get our answer. Many ways to read data. Can forecast weather for the next several weeks. Battery backup for power outages. AcuRite offers us three weather stations in this review. The first of three comes with a touch screen monitor, AcuRite access hub, an AC power adapter, wall mounting brackets and a battery pack. This AcuRite weather station allows you to read local weather temperature, wind, humidity, precipitation, UV index and even light intensity. Included with this weather station is a large portable screen that you can see detailed weather information on. This screen works like a tablet in the sense that you can touch the screen in order to navigate through the program’s menus. If you want your weather information on your smartphone, you can also do this, albeit the information is made short and sweet to best fit inside a smaller phone screen. In order to access this info from your phone, an Acurite Access hub is require, but is also included with your purchase. You can also view weather information on your computer or laptop. The free app for smartphones can also be downloaded for computers. So there are more than two ways for RV owners to see current weather information without relying on just one screen to do it with. The screen that comes with this weather station is large and high-definition, just like a tablet. It is vibrant, you can see information from far away and it can stand on its own, so multiple people in a room can see its data without having to huddle around it. Readings of this weather station are fairly accurate with only a one-degree margin of error. This gives RV owners accurate readings with ongoing updates in weather every five minutes. It’s neither slow nor unreliable, which is a station that you can count on. When you purchase this weather station from AcuRite, you get one year on your warranty. It’s not the best warranty, and is rather brief considering the technology involved, but it is better than nothing. By “portable”, we mean you can carry the screen with you, but it is not battery operated. It requires power from a cable in order to work, so it will always be tethered so that it stays on when you want it to. Thankfully, you can also use your smartphone for portable weather forecasts. Furthermore, this is not a weather station that is made specifically for RVs, so you will need to make modifications to your RV if you want this station installed on it. Tablet has large, clear screen. Tablet requires power cable for use. This is the cheapest and smallest of the RV weather stations in this review. You can get this weather station either in black or grey. This weather scation’s screen is very similar to a calculator, or a Tiger Electronics handheld game. The screen is very small, and can be placed upright on a flat surface. This is a screen that you leave on the table, rather than have with you. Like the previous La Crosse weather station, the screen on this can display both outdoor and indoor temperature. Unlike the other La Crosse weather station, temperature and weather conditions is all that it will display. It will not display humidity, wind, precipitation, etc. This runs on 5 AA alkaline batteries, but we feel that this doesn’t eat them, and instead uses very little power in order to display the weather. You won’t have to worry about expensive power supplies or ongoing battery costs with this weather station. This is a weather station that is easy to install. The dongle will send the weather data and the screen receives and displays it. This is a good screen that you can display on your table or nightstand whenever you want to look at the time, indoor temperature and more. Or if you’d like, you can also use this screen as an alarm clock. Wake up to the current weather, in addition to the time. Perhaps this is something you didn’t think you would ever want, until now. Like the other La Crosse weather station, we feel that this is just a clock/current weather display. It will not forecast weather a day or a week from now, meaning that it isn’t designed to do such tasks like the other weather stations from AcuRite. Furthermore, with LCD display and lack of color, we do not find one positive trait this has over the other La Crosse weather station, other than the fact that this one costs less money. You basically get what you pay for, but perhaps this would make for a great gift for a loved one. This AcuRite weather station allows you to read local weather temperature, wind, humidity, rainfall, UV index and even things such as moon phase. “Learning mode” is a feature that allows the weather station to self-calibrate the weather for up to 33 days. This mode is only useful, however, if you live in the same area for more than two weeks. If you constantly travel, then your weather predictions aren’t as accurate, unfortunately. Without “learning mode”, it can still forecast weather up to 24 hours in advance. This weather station doesn’t come with a “hub” like the other Acurite weather station, but it does come with a screen with buttons on it, similar to a GPS device. This screen displays lots of colorful information about the local weather. This weather station comes with a one-year warranty. You have a whole calendar year to check for any problems with wither the station itself or the screen that it comes with. As far as smartphone compatibility, you can upload your weather information to Weather Underground, and that information will be displayed by other people in the area from their smartphones and computers. It might not be that helpful to you if you are camping out in the middle of nowhere, but it is another thing that might still be good to have. The station itself is wireless, meaning that there is no cables or connections required to have it turned on. It runs on four AA batteries. While you have to keep supplying it batteries, you also aren’t required to have a power generator or other electrical source to use it. The monitor that it comes with is the achilles heel of this weather station. While it is a colorful screen, it can also be unresponsive at times, making it more of a hassle than it has any right to be. Along with having to pay for batteries, this can be a really fussy station. The third AcuRite weather station is their least expensive offering, which many RV owners can easily afford. Along with this weather station, you also get a portable screen and a power adapter. You can get this weather station either in black or white. This is a weather station that is small and rather simple to install. It is capable of forecasting the weather from either 12 or 24 hours in advance. Apart from being hung on wall siding, it can also be easily placed on a surface, but obviously when your RV is parked for a while. It can record temperature, wind, rainfall, humidity, and other weather factors. With its sensor, it will have some significantly accurate weather information for your area. It has a 2-degree margin of error, however. This weather station is powered by two AA batteries, opposed to four with AcuRite’s previous station. You can use either alkaline or lithium ion batteries. “Learning mode” is also present in this weather station. It self-calibrates weather for up to 14 days. This mode is only useful, however, if you live in the same area for more than two weeks. If you constantly travel, then your weather predictions aren’t as accurate, unfortunately. Without “learning mode”, it can still forecast weather up to 24 hours in advance. We like how affordable this is. For people that disagree with how these weather stations are priced, they can consider this weather station without breaking the bank. If you just want something to tell you the local weather and nothing more, getting this model will not disappoint you. We honestly do not understand why this is a cheaper weather station when it has around the same features as AcuRite’s more expensive offerings, such as the 330-foot range and learning mode. The screen is decently sized, and the screen is clear and easily readable. We are not fans of the plastic design, however. We look like that it has a stand so that it can sit on surfaces without lying down. This weather station comes with a one-year warranty, just like the other products from AcuRite. You have a whole calendar year to check for any problems with wither the station itself or the screen that it comes with. Despite the value that this weather station comes with, there is simply no easy way to install it. It is meant to be hung on a wall, but considering that the RV is a moving vehicle, it may not be the recommended way to use the weather station. You will need to take matters into your own hands in regards to how to secure this station outside your RV without having to take it inside. No proper way to install for RVs. La Crosse has one one, but two weather stations for us to review. Along with this weather station, you also get a portable screen and a power adapter. You can get this weather station either in black or white. This is a simple and affordable weather station that comes with one dongle and one screen. The dongle sends data to the screen, and there basically is all there is to it. This weather station requires three AAA batteries, so you aren’t required to hook this up to a power supply, and you can carry the screen around with you anywhere you go. This weather station records weather conditions, temperature, humidity, wind and more. On one side of the screen you can also get information about indoor temperature. It also displays the time and will always be accurate, even after daylight savings. The display on the weather station’s screen features a black background, rather than a white one. Not only is this a breath of fresh air in the world of technology, but it is also easier on the eyes when viewing the screen at night. With white backgrounds, the screen is overall brighter, and the monitor, as well as your own eyes, need to work harder, while getting lots of strain in the process. The batteries also likely save more power with a black background. This is a good screen that you can display on your wall whenever you want to look at the time, indoor temperature and more. This is a screen that you leave on the table or on the wall, rather than have with you. This weather station is just very limited in terms of what it can do. While it is nice, it does not forecast; it only displays current weather. This station isn’t going to help you anticipate stormy weather, it will only show you the weather as it is happening, making it not useful for predicting. It is aptly priced. 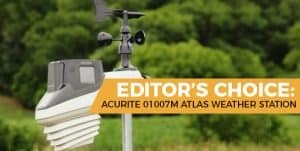 The best RV weather station is none other than the AcuRite 01007M Atlas Weather Station. It might be AcuRite’s most expensive package for just being able to receive weather updates and forecasts from your RV, but we feel that it is well worth the money invested. You get the high-quality weather station, a sleek and handy screen and an AcuRite Access hub all in one package. The versatility on the AcuRite 01007M is phenomenal. Even though the range on less expensive weather stations is just as effective, this weather station in particular allows you to read weather results and forecasts in many different ways; either on the proprietary screen itself, on your smartphone via the free app or on your desktop via a live program. You can simply get the weather any way you want, while still being off the grid, which outdoorsy people like yourself wouldn’t have it any other way. The only bad thing about this weather station is that you need constantly running power to use it and to receive weather results. This means that you will need a working generator or other power source, and you will need a proper way to install it on your RV. However, once these nuisances are taken care of, the weather station will begin to feel like it is part of the RV itself, seamlessly. There are other weather stations that are by far easier to install than this one, but you wouldn’t want to try to mount them on your RV at all, especially due to their handheld sizes.